A Russian Soyuz 2 rocket launches on Dec. 28, 2011 from Baikonur Cosmodrome, Kazakhstan carrying six new Globalstar communications satellites into orbit. A Russian Soyuz rocket launched a pack of communications satellites into orbit Wednesday (Dec. 28) in a successful flight that comes less than a week after a similar rocket crashed somewhere in Siberia. The Soyuz 2 rocket launched six new satellites for Louisiana-based communications provider Globalstar at 12:09 p.m. EST (1709 GMT) in an apparently smooth liftoff from the snow-covered central Asian spaceport of Baikonur Cosmodrome in Kazakhstan. The rocket lifted off from the same site used by another Soyuz 2 booster on Friday (Dec. 23), but that earlier launch met with disaster when it crashed in Siberia, destroying a Russian military communications satellite. 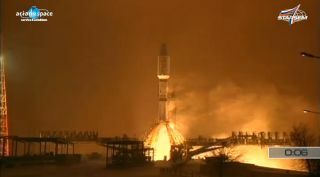 This image shows Soyuz at the start of its climb-out from Baikonur Cosmodrome on the ST24 mission on Dec. 28, 2011. The rocket carried six Globalstar communications satellites into orbit. Russia's Federal Space Agency (Roscosmos) is investigating the recent rocket failure — which was the fifth space mission failure in 2011 for the country — and is expected to present an initial report to the Russian Deputy Prime Minister Dmitry Rogozin on Thursday (Dec. 29), according to Russia's ITAR-TASS news service. Last week, Russian space agency chief Vladimir Popovin said that an engine failure was the most likely cause of the Dec. 23 rocket crash, though more investigation was needed to be sure. Today's Soyuz 2 rocket launch was overseen by the European launch provider Arianespace via its Russian affiliate Starsem. The booster carried six second-generation Globalstar satellites — each weighing 1,543 pounds (700 kilograms) — into an initial 572-mile (920-km) orbit. The satellites are destined for an operational orbit that reaches an altitude of about 878 miles (1,413 km). The mission is the third in a series of Globalstar satellite launches, Arianespace officials said. Twelve satellites were launched on two earlier missions, each orbiting six of the craft, in October 2010 and July of this year, they added. Another six satellites will be launched for Globalstar in 2012, Arianespace officials said.